The exhibition premiering at the University of Victoria’s Legacy Art Gallery Downtown, IN DEFIANCE emerges from Iroquois Mohawk artist Lindsay Delaronde’s photographic project entitledSquaw. This project, in utter defiance to that negative word long often used to denigrate Indigenous women, seeks to break down the stereotypes. These individual portraits dismantle the negative stereotypes of First Nations women by allowing the individuals to portray themselves more authentically reflecting truth of diversity, power, and respect. Join us “In Conversation” with artist Lindsay Katsitsakatste Delaronde (Iroquois/Mohawk) and Sarah Hunt (Kwagiulth), Assistant Professor of Critical Indigenous Geographies to explore this in depth photographic project through various artistic, social and political lenses. 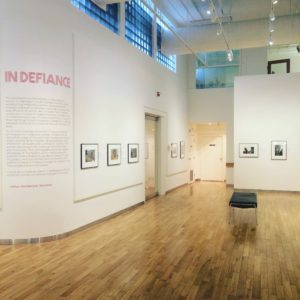 Inspired by the courageous women who expose their inner worlds through self-portraits in the exhibition, In Defiance, artist Lindsay Delaronde, will facilitate a safe and creative environment to explore hidden aspects of ourselves that may have been oppressed by dominant culture and societal norms. 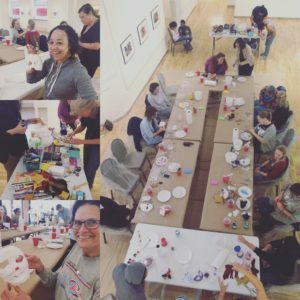 Make a mask that shows your external persona and your hidden self. The workshop will begin with a discussion in the exhibition with the artist. Facilitated by artist Lindsay Delaronde, as a group we will discuss identity and life experience in light of 33 self-portraits by Indigenous women in the exhibition, In Defiance. Using the discussion as a jumping off point, we will make corn husk dolls as an expression of our essential identities. Learn how the tradition of corn-husk doll making can be used in contemporary contexts to assert personal agency. Image credit: Lindsay Delaronde, Kelly Aguirre. This entry was posted in Legacy Downtown, Online Projects, Past Exhibition, UVic Faculty and Alumni on 7 January, 2017 by khughes.